It appears that someone from Google came to the archipelago in August 2005 and one of their commercial directors reached an agreement, “free of economic exchanges”, with Grafcan for Grafcan to provide the images. Apparently, Grafcan are the first European company to obtain such an agreement. Bernardo Pizarro, managing director of Grafcan, says that they have received a lot of complaints from users who want to see up-to-date images. Thanks for the mention Stefan. I’ll try to keep my eys on the situation and if anything new comes up locally, report it back here. Yo can bet on it. 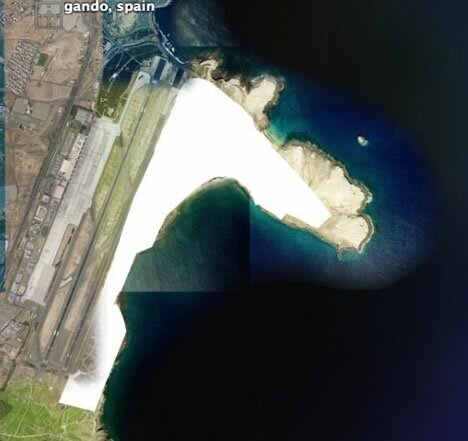 Digital Globe imagery wasn’t censored, and indeed you could saw perfectly some F-18 at Gando… Curiosly, in this new images the military naval base in Las Palmas is clearly visible, with no censorship….